1. Create a HTML file name starts with EmailTemplate_ (eg, EmailTemplate_Customer) put it into c:\soopos folder. We are pleased to confirm your membership and thank you for your business. Please review the information carefully and contact our Sales department for any changes or more information. 2. If you have not already set up a default email program, you can do it here. 3. Navigate to the customer you would like to send an email and select the Email button. It will bring up your templates in a menu, click on it to open it in your mail program. 4. A new email will be created addressed to the selected customer. 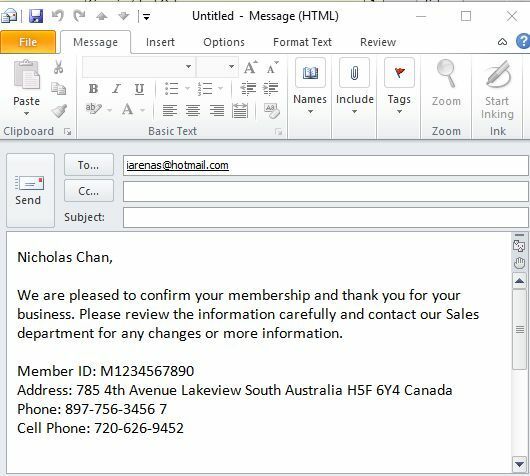 Based on the template, customer details will populate into the email as well. Using the example template provided this is what you would expect to see from a sample customer. Please use EmailTemplate_Invoice.htm as HTML file name and put it into c:\soopos folder if you Email the invoice.